Favorite Position: Upright and on the track! Significance of Name/Number: Hildegard of Bingen was an amazing 12th century writer, composer, philosopher, healer, and visionary, and she even invented a language. I relate to that level of nerdiness. And Bring It? That’s what I’m going to do every bout. Likes: Cats, knitting, reading, roller derby, coffee, and chocolate. Dislikes: Hatred, bigotry, cruelty, and pickles. Favorite After-Party Beverage: Water with nuun, or Coca-Cola. 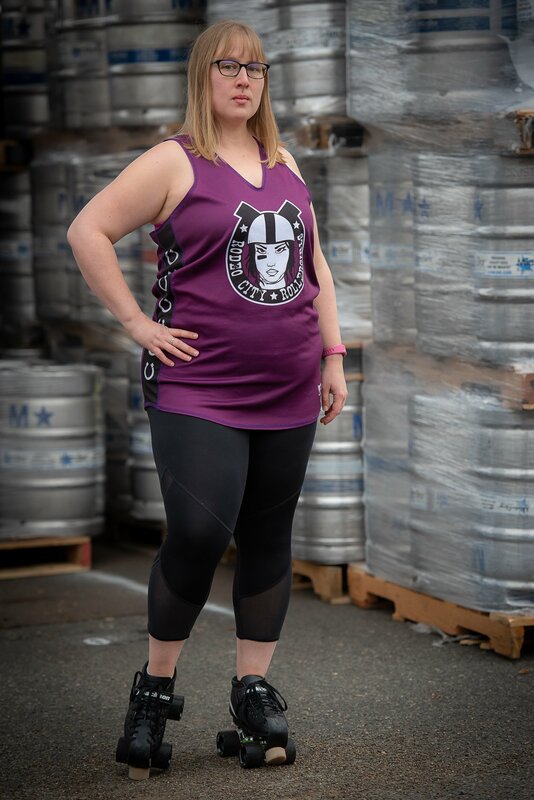 Bio: In elementary school, I roller skated nearly every Friday night, then occasionally in high school, then not again for nearly twenty years when I finally joined roller derby! In between, I got my Master’s degree in Museology, ran a marathon, and knit sixty-seven pairs of socks.